For what types of events do you play? 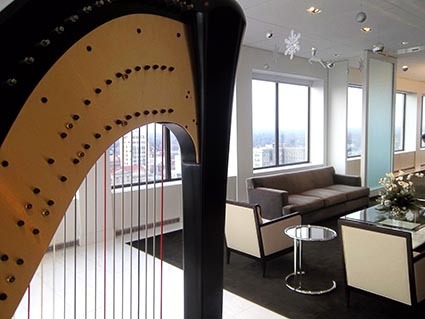 I love providing harp music for receptions, corporate parties, anniversaries, bridal & baby showers, graduations, retirements, christenings, church services, funerals & memorial services, grand openings, trade shows, conventions, St. Patrick's Day parties, community events, holiday parties, concerts, bar and bat mitzvahs, restaurants, and banquets. Any event can be enhanced with the elegance of live harp music! Rates depend upon the date, location, and length of time you require music. Please contact me with this information to receive a customized quote for your event. Will we be able to hear the harp? Background music bookings include amplification at no additional charge. If available, I can also plug in to the house, DJ, or band sound system. Do you have reviews or recommendations from past clients? Yes! Please visit my Testimonials page for comments from event planners, party hosts, and newly-married couples who have hired me as their harpist. All events require a signed contract and a 50% deposit. Please visit my Booking FAQ page or contact me for more information.